In many cases there is a need in changing some "in game" parameters dynamically, depending on time or something else (e.g. lighting conditions). For example, one needs to change some parameter depending on time: the parameter animation can be stored as a sequence of animation keys: values and their time. To calculate the parameter value at any given moment of time it's needed to find the previous and the next keys and make some kind of interpolation between their values. KeyLine system handles key sequences and takes care of interpolation between key values, providing GUI for data manipulation as well. It is a somewhat data-driven system, meta-information is stored in the XML format. KeyLine scripts are located in data/scripts/keyline directory of UNIGINE SDK. Param is a type of an atomic parameter, whose value needs to be changed dynamically (see ParamBase class). Param can be serialized to XML and deserialized from it by using meta-data (ParamDef). There are functions associated with the parameter, which specify how parameter's value is applied to some environment (setter) or retieved from it (getter). There is a pre-defined set of "basic" parameter types available out-of-the box: ParamFloat, ParamInt, ParamVec4 classes. ParamDef is a definition of a parameter (type, ParamEditor, min/max values, default value, setter/getter functions). ParamDef class is used to create parameter instances by its definition. ParamEditor is a definition of GUI editor type, which is used to edit parameter's value (see ParamEditorBase class). Key is a set of parameters grouped by some subject (see KeyBase class). KeyDef is a definition of a key (set of its parameters' definitions). KeyDef class is used to create Key instances by its definition. KeyLine is a sequence of keys (of the same type), each of which is identified by a position. KeyLine is responsible for smooth interpolation between keys. When KeyLine cursor position (current position) is behind the last key, KeyLine makes interpolation between the last and the first keys (see KeyLine class). KeyLineManager handles set of KeyLines (see KeyLineManager). It is also responsible for global settings of min/max positions. *.keyman file contains settings of KeyLineManager in XML format. The keyline_manager node must be a root of the node hierarchy. This node has the following mandatory integer attributes: min (minimal position for all KeyLines in the KeyLineManager) and max (maximal position for all KeyLines). Besides that, integer attribute duration specifies the time period during which the KeyLineManager will pass from the minimal to the maximal position. According to this code, the day in the game consists of 86399 in-game seconds and lasts for 1440 real seconds. This means that the keyline will pass through 60 positions during 1 second in the real time (86399 s / 1440 s = 60) and the in-game day will correspond to 24 real-world minutes (1440 s / 60 s). KeyLineManager class allows to programmatically define duration and floating-point multiplier that controls the speed of time change. For that purpose it has member functions setDuration() and getDuration() as well as setMultiplier() and getMultiplier(). *.keyline file contains keyline data in XML format. Only one keyLine can be stored in a file. keyline node must be a root of the node hierarchy, it has mandatory name attribute. min and max attributes has the same meaning as keyline_manager ones, but their values will be ignored, because they are overriden by KeyLineManager. keyline node must have key_def node as a child. key_def (key definition) node: reference format. file (required) - Used to specify file, which contains key definition in the format described below. key_def node - full format. keyline (required, if key_def is placed into separate file and is optional, if key_def is placed into keyline node). type (required) - String identificator of a parameter type. Used to create a parameter instances by name. name (required) - Unique parameter name. Used to identify the parameter in a key. editor (required) String identificator of a parameter editor type. Used to generate GUI for editing keys. keyline node has children key nodes, which contain keys' data. If there are no keys in the keyline, one key will be created automatically. This key will be filled using parameters retrieved by getter functions from the environment (this may be usefull when starting from previously tuned non-sequenced parameters). key node. 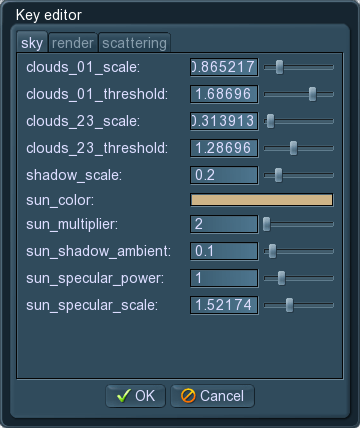 Contains set of parameter values. pos (required, unique) - key position on keyline. param node. Contains parameter data. *.keydef file contains definition for key types in XML format. definition node must be a root of a node hierarchy. version attribute is reserved for future implementations. definition node contains set of key_def nodes in the full format, which is described in keyline files definition. KeyLine provides GUI editors, which allows user to manipulate keys and change parameter values. Refer to the following to use GUI editor in your project. If basic parameters don't cover all of your needs, you can write your own parameter types. KeyLine system automatically generates GUI for editing keys.